After Nathan’s girlfriend, Lee, is murdered at Nathan’s home back on Earth, a distraught Spring returns to assist. 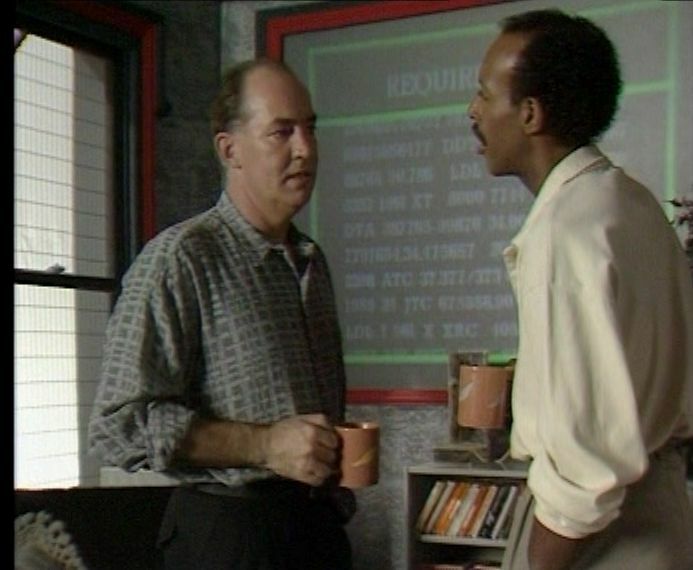 But the officer leading the investigation, Colin Devis (Trevor Cooper), is very antagonistic towards Nathan. Does he believe that Nathan is implicated or is he simply enjoying the chance to needle a superior officer? Meanwhile, the Star Cops have moved to a permanent base on the Moon. Theroux, now acting as Nathan’s deputy, has a strange case to deal with. A freighter bound for Mars fired its rockets too early which means there’s no way for them to regain their course – and with only a limited oxygen supply the two occupants face certain death. That is, until Professor Paton (Alan Downer) makes a suggestion ….. Conversations with the Dead manages to juggle two plots simultaneously and by the end of the episode Nathan has another new recruit – Colin Devis. He’s not someone who Nathan would necessarily have chosen if he’d had a free hand though. Earlier on, Nathan tells Theroux that Devis is “one of the department’s all time cretins. British, native and all-time record holder. A cretin’s cretin in fact “. After hearing this, Theroux ironically ponders if Nathan’s going to recruit him. But since Devis later puts his own career on the line to help Nathan, it’s obvious that he feels honour bound to offer him a job. So the “cretin’s cretin” does end up with the Star Cops after all. The feeling that the Star Cops are something of a home for waifs and strays is further reinforced in the next episode, Intelligent Listening for Beginners, as Pal Kenzy cannily manages to manipulate the media in order to force Nathan to reinstate her. And later on in the series, Anna Shoun is another officer who Nathan recruits mainly because his investigation has caused her to lose her existing job. His quest for the truth is hampered by Devis though and his hostility towards Nathan doesn’t quite ring true. If he’d had been part of the conspiracy it would have made sense, but since he’s not it just implies he’s not a very good copper (something he glumly admits at the end). Given this, it makes him even more of a lame duck appointment to the Star Cops. Back on the Moon, Theroux is kept busy investigating the mystery of the malfunctioning freighter. It’s interesting that we never see the interior of the freighter – instead we only ever hear the voices of the two crew-members as the (admittedly very nice) model flies through space. Was this a budget choice or as scripted I wonder? The freighter story is very much the “b” plot as all the action is still taking place on Earth, although some of it could have been staged better. I’m thinking particularly of the attack on Nathan in the park, which looks terribly unconvincing. But better is to come when Nathan returns to Space and is later joined by Devis’ assistant Corman (Sian Webber). Lee’s murderer is heading for a top-secret unmanned American Orbital Station and Corman, along with Nathan and Theroux, are in pursuit. Since the police are politically neutral, they have a perfect right to approach the station and extricate the murderer. And boarding the station is exactly Nathan is supposed to do. Lee’s murder took place for precisely this reason – to give a British intelligence agent (Lee’s murderer) a legitimate pretext to approach the station. Once on-board, he’ll attempt to learn everything he can about the installation before he’s arrested and taken for trial – later, no doubt he’ll mysteriously disappear. But Nathan isn’t prepared to be a pawn in anybody else’s game and his solution will ensure that the secrets of the station remain with the Americans. Given Chris Boucher’s previous writings (especially Blakes’ Seven) it’s no particular surprise that Conversations with the Dead demonstrates a deep distrust of authority. Exactly who Corman works for isn’t made clear, but it’s obvious that she belongs to a shadowy part of the British government. The murder of an innocent (Lee Jones) appears to be regarded as a small price to pay for the intelligence that could be gleaned from the station. The personal angle of the case, and how it impacts Nathan, is the best part of the story. 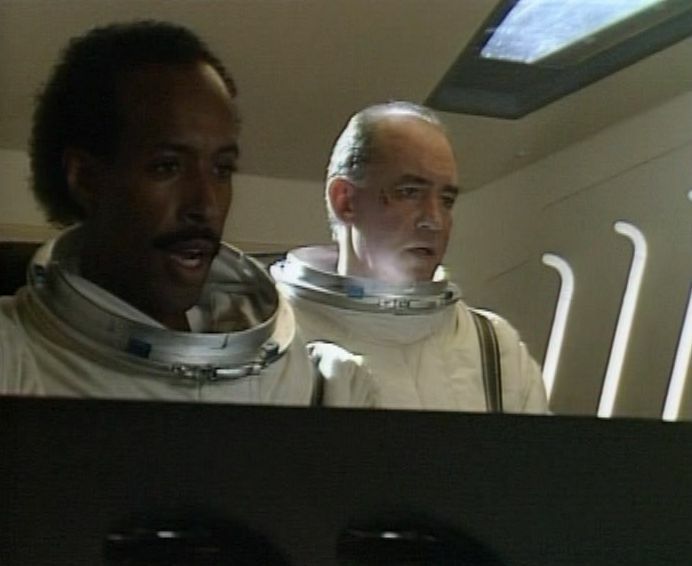 Trevor Cooper’s first appearance as Devis is, as I’ve said, a little off – but over the next few episodes he’ll strike a better balance between portraying Devis’ less appealing character traits and his skills as an officer (especially when the core team are all together on the Moon). Series creator Chris Boucher had been a script-editor on both Blakes’ Seven and Bergerac, so he certainly had the experience to craft a SF detective series. Set in 2027, it depicts a future where space travel is now an everyday occurrence. There are thriving colonies on the Moon and Mars, five space-stations operated by various countries and deeper space-bound explorations are also becoming more common. But with the increased number of people making regular trips into space there’s an obvious need for a professional space police force. Up until now, the International Space Police Force (ISPF) has consisted of twenty or so part-timers, disparagingly nicknamed the Star Cops. This needs to change – and what’s required is a permanent force of full time professionals, led by a new Commander. It’s decided that Nathan Spring (David Calder) is the ideal man for the job – although Nathan is far from keen. For one thing, he’s a most reluctant spaceman (he says that he always preferred Sherlock Holmes to Dan Dare) and for another he rightly suspects that he’s being pushed sideways by his boss (Moray Watson) who simply wants to get rid of him. Nathan is an oddity – he’s a detective that prefers to think for himself, rather than let the computer make his decisions for him, which on Earth makes him something of a misfit. Hence the title of the episode, An Instinct for Murder, which shows us two murders (one on Earth and one in Space) that are only solved by human ingenuity. In both cases, there’s a plausible computer solution, but Nathan isn’t convinced by either and eventually he’s proved right. On Earth, his maverick nature is seen as a liability, but out in Space – the new frontier – it’s an asset. Or that’s how his boss tries to spin it to him. It’s clear that Space is the new Wild West – somewhere which has been largely unregulated until now, but the arrival of a new Sheriff (Spring) will bring law and order firmly back. And since he’s far away from any interference from his superiors, he can dispense his own brand of justice without constantly having to seek approval from the computer. The episode opens with two murders. Since they’re identical, you could be forgiven for thinking that there’s a connection between them, but that’s not the case. The point that’s being made is that crime in Space is just the same as crime on Earth. Despite the different environment, solving it will need precisely the same skills. On Earth, we see a man out for a swim. Two others catch up with him and drown him. In Space, we see a man in a spacesuit orbiting the Earth. Two others catch up with him and remove his oxygen supply. Nathan isn’t convinced that the drowning was an accident (as the computer suggested) and urges his subordinate to investigate further. In Boucher’s original draft, the first story was spread over two episodes and it would have seen Nathan investigate the murder himself. As it is, the compression of the story to fifty minutes meant that he only has a peripheral interest the case. To be honest, it’s not terribly central to the story (the man was murdered on the instructions of his wife) and neither are the Space murders (a series of deaths which the computer decides were caused by space-suit failures). The murders simply exist to demonstrate Spring’s philosophy of detection. Chris Boucher’s relationship with producer Evgeny Gridneff was uneasy from the start (apparently when they first met, Gridneff told him that all his scripts would need to be rewritten). Although he was generally positive about many of the cast, especially David Calder, other aspects of the series irritated Boucher – especially Justin Hayward’s theme tune. I like it, but I suspect I’m in something of a minority. What’s interesting about it is that it may have been written very early during the production of the series. The lyrics of “It Won’t Be Easy” seem to refer to how difficult it will be to maintain a relationship when there’s an Earth/Space divide. I assume it’s about Nathan and Lee Jones (Ginnie Nevinson). Possibly Heyward assumed that Nathan and Lee would remain an item throughout the series – as we’ll see though, her story has a very finite end. Nathan’s rather a cliched figure (although thankfully Calder is able to make something out of even the most routine material) and his relationship with Lee is a prime example of this – he’s portrayed as a workaholic who has little time for anything else. He clearly loves her, in his own fashion, but lacks the same insight with her that he brings to his police work. The most obvious example is when he continues to book them into a restaurant which Lee dislikes! After Nathan’s transfer to the ISPF is ratified, it means leaving her behind. Boucher could have kept her as a regular during the series, but he does something much more interesting – which will pay off in the next episode. Once Nathan’s “out there” he has to start assembling his force. Some of the existing ISPF officers are worth keeping – such as David Theroux (Erik Ray Evans). Others, like Pal Kenzy (Linda Newton), will later be viewed with more caution. Kenzy only has a cameo here, but from her first scene it looks highly likely that she’ll be headed on a collision course with Nathan (although after a few episodes it’s just as clear that eventually, after many trials and tribulations, they’ll form a close working relationship). As previously touched upon, the mystery of the murders very much takes second place to setting up the series format. But thanks to the quality model-work (which remained consistently good throughout the run) and Calder’s strong performance, An Instinct for Murder is an impressive opener.